I’m on a plane as I write this, headed to give a keynote and workshop for the good people at UNC-Wilmington and Coastal Youth Media Project. There’s nothing like travel to make us wake up, pay attention, become alive in all our sense. Plane crying is a documented phenomenon. Even the most locked down, poker-faced, austere people, folks who travel commonly, find themselves crying unexpectedly when they reach cruising altitude. you get to be on one today? Despite the fact that plane crying is a thing, no one knows exactly what the cause is. Perhaps it is simply that we have less oxygen. It could be that many of us become less connected with our technology for a while and run smack into ourselves, having to just sit and think like we don’t otherwise on a normal day. I’d like to think that it has to do with just being one step closer to our mortality. Here’s another thought. There’s nothing like climbing up into the atmosphere and looking back down on Planet Earth to get you out of your tiny little world, remind you that you are part of something greater. While I might know logically that there are billions of other people in the world, there’s nothing like looking down from 30,000 feet to understand it more clearly. To sonder, as it were. Up in the air, I find myself lost in thought about climate change a lot. As much as flying is an environmentally complex choice, it brings perspective on the state of our planet. Observing a city from above, with all that smog hovering, or passing over a still undeveloped swath of land and wondering who might currently be making plans to extract its resources—that can lead me to ugly plane cry pretty fast. At the end of the day, whatever the cause, I’m just so glad people are able to acknowledge and talk about this common moment of emotional release. Would that we all had more opportunities for catharsis on a regular basis. As I continue to work on Walks with Grief, I’ve come across several pieces discussing how protracted grief, anxiety, depression, alcoholism, disordered eating—so many maladaptive behaviors—come from our unwillingness to simply sit with and process our emotions as they happen. Things get stymied, diverted, bottlenecked. The further we push them down, the more they amplify, push back, revisit upon get us. I loved this story when it came out. 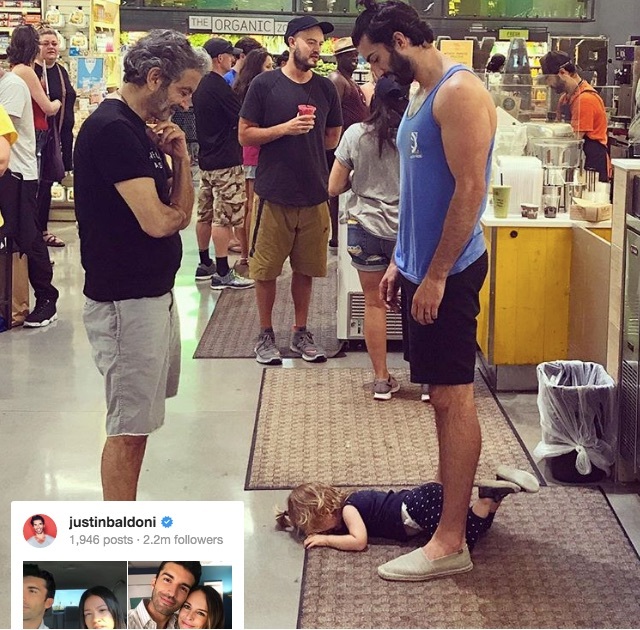 Justin Baldoni, co-star of Jane the Virgin–amazingly smart and heartwarming show!–went viral with this small slice of life. He and his dad are letting his toddler have a temper tantrum on the floor in public. See how they look on with patience and compassion as the child moves through her state of unrest? If you click through, you can see Justin’s reflections on this moment and what he learned from his dad about letting the emotions exist. How much better is that than to give the message of DRY IT UP?! Especially to a child so young and incapable of doing anything but being present in her own state of emotion. Looking at that image, can you imagine that you have become split into both the parent and child at once? What if we both acted like the child, letting ourselves go through what we’re feeling, as well as act as our own internal parent, noticing it all, loving ourselves through the process? If we can just lay down on the floor and feel the feels, then things can move through, return to baseline, so much more quickly. As the captain announces that we are about to land, I wish you all the best in the journey of your life. What adventures have brought you new thoughts and ideas? Have you found yourself sitting on a plane, having an epiphany? And what wounds are still there, festering, because you never allowed them the stage they rightly deserved? Note: This post was originally published in my monthly MailChimp newsletter, a fun digest of articles and events. Please consider subscribing if you haven’t already!